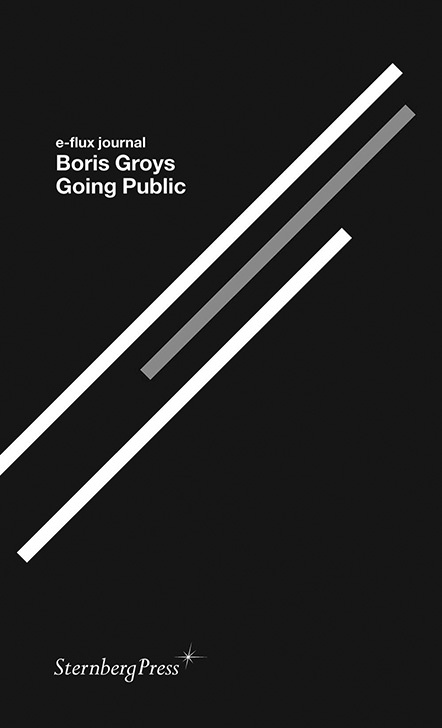 The philosopher, media theorist and art critic Boris Groys (b. East Berlin, 1947) has published substantial theoretical studies, such as Über das Neue. Versuch einer Kulturökonomie (1992), Unter Verdacht. Eine Phänomenologie der Medien (2000), Topologie der Kunst (2003), Das kommunistische Postskriptum (2006) and History Becomes Form: Moscow Conceptualism (2010). Serious literature, whose influence on various discourses is justly deserved. But Groys is by no means a withdrawn sitting-room scholar or a university-ensconced academic: he is an active presence in the art world that he reflects upon in his books. He teaches, gives frequent public lectures, makes video films (Thinking in Loop: Three Videos on Iconoclasm, Ritual and Immortality, ZKM, Karlsruhe, 2008) and exhibitions – this year, Groys, a native Russian, was appointed curator of the Russian Pavilion of the Venice Biennale. Recently, short essays of his have been coming out at a fast clip, both online and off-line, usually written on commission for an exhibition, conference or theme publication. They testify both to Groys’s ‘complicity’ and his established renown. In 2008, MIT Press published Art Power, a miscellaneous collection of essays in which Groys describes and analyses the modern work of art from various perspectives and contexts (including newness, the curator, biopolitics, digitalization, war, social realism, Europe) as a ‘paradox-object’ that simultaneously functions as a commodity and as ideological propaganda – also and particularly, contemporary Western art – and that wields power in those capacities. Quite recently, Sternberg Press brought out Going Public, a compilation of essays Groys wrote for various issues of the monthly online publication e-flux journal, the editorial project of Anton Vidokle and company. Going Public is the first of a series of printed e-flux journal readers, each of which will comprise work by only one author. Just as in his previous books, in Going Public Groys positions contemporary art, its institutions and protagonists specifically within modernism / the historic avant-garde, the media culture and the post-communist era. In these discursive contexts, he considers common concepts such as the installation, the project, design, the museum, the body, etcetera, which he examines as constructions of this age and turns inside-out. Groys’s essayism is authentic, and at times sooner prosaic than academic. He writes in a concrete manner, eschewing ideological rhetoric or fashionable philosophical vocabulary. This apparent lightness and his accessibility do not alter the fact that he indeed considers and analyses art in terms of its ideological function. Groys’s art and cultural criticism excels in sharp thought experiments that arise from paradoxes and inversions of ready-made ideas, in which established identities and power structures are exploded through their own internal logic. His clear insights challenge the reader to formulate new questions. In Going Public, the central issue is the changed relation between the viewer / public and the artist. With the advent of visual media, of the Internet and its social networks, art must no longer be considered aesthetically, but ‘poetically’; that is to say, from the perspective of the art producer instead of the consumer, according to Groys. (The word ‘poetry’ stems from the Greek poiesis: creation or production). In the age of digital media and the globalized presentation-and-distribution platform of the Internet, the focus is increasingly on ‘autopoiese’, the production of one’s own public self – ‘autopoiese’ literally means self-production. He argues for a change of perspective: moving away from the modern aesthetic or hermeneutical analysis of the work of art, which encourages a consumptive attitude, and returning to a more technical and poetical concept of art. Only from the position of the producer can we get a grip on the implications of current shifts in terms of the public and the private, the consumer and the producer, the amateur and the professional, the physical and the virtual. At the same time, according to Groys, from this non-aesthetic perspective, art can become visible beyond capitalism and the art market, and thus broaden its range and significance. Only when considered from the point of view of the producer can there be a question of a ‘politics of art’, argues Groys, seeing as this concerns a dimension that has nothing to do with a work of art’s impact on the viewer – which produces an aesthetic experience – but with the actual decisions that precede the creation of a work. More specifically, this compilation of essays further considers the art installation as a private autonomous zone within the museum, the (im)possibility of the collective social project in art, design and self-design, religion in the age of digital reproduction and Beuys’s statement ‘Jeder Mensch ist ein Künstler’ in relation to the supposed de-professionalization of the artist. The underlying question in all of these essays is whether art and the artist are losing their exclusivity and professionality, and thereby also their privileged position, now that everyone has become a producer and can publicly manifest themselves in the networks and the media. Groys tries to perpetrate a ‘creative’ form of criticism that is not about the subversion of contemporary art and the art world, nor the superficiality of the public media culture, but about the broadening of ideas and new relations. And about similarities rather than differences. Taken concretely and materially, what actually are the similarities between contemporary works of art and the visual products of media users? And what do artists have in common with other ‘producers’? Nor is it about giving up art, or completely eradicating the differences between identities and domains, between high and low culture. Groys sooner appears to be seeking what is left of art and artistry outside the established categories and eroded value systems. In the introduction to Going Public, he writes that from the perspective of aesthetics, art does not have a privileged position, because after all there are so many things and phenomena in the world that can be considered or experienced as aesthetic (page 13). It could be that with his pushing forward of the perspective of the producer, Groys wants to recuperate that privileged position by taking an opposite tack, out of cool romanticism, via a different legitimization. But knowing Groys’s way of thinking, he would never consolidate that, let alone consume it.